We are an Antwerp based knitwear brand, since 1981 we have been producing quality knitwear in Scotland and in 2009 we launched our new label Howlin (Scottish slang for smelly). The way of manufacturing remains traditional but Howlin offers more room for fantasy in shape and pattern. At Howlin we strive for timeless, playful products that are made with care. So whether it is a scarf or a shaggy waistcoat; all our products are individually manufactured and hand finished by traditionally skilled craftsmen in either Scotland or Ireland using the highest quality wool yarns possible. Come and have a look at the wool garments in our specially decorated window display. “Head, heart and dress. When they work together, a woman can shine from the inside,” Dorothee Schumacher says. Her name presents much more than a ready-to-wear collection, it represents uncompromising femininity and a very special spirit. In March 2014, Dorothee Schumacher opened her first store in Belgium’s avant-garde metropolis – next door to the Fashion Museum on the Nationalestraat. Her fall/winter 2014 collection is an invitation for modern women to live with passion, without compromise. Extravagant, carefree and lavish. During Wool Week in Antwerp, we celebrate wool with a very special piece from our fall/winter collection where knitwear is featured in exciting textures. A mini-collection based on the Wool Week exhibition piece of Damien Ravn, will be on display at our store ( level -1 ). Maison Anna Heylen is specialized in unique pieces and limited editions. We work on measure in our in-house atelier. In the store you will find unique wool items which you won’t find elsewhere worldwide, for special nights out as well as stay at home luxury. Our new Autumn Winter 14/15 collection “Rock ‘n Roll Landscape” is presented in our flagship store. The collection is inspired by the world of rock n roll legends, based on artisanal hand-made knitwear. During Wool Week we will celebrate wool through our exciting window display! A special version of the scarf shown in the Wool Week exhibition is available in our stores. LOVE IS ESSENTIEL. In the Xandres and Xandres xline stores you will find a beautiful 100% wool ensemble with rhinestones. Discover the horizon blue coat, one of this season’s most fashionable colours, at Xandres. 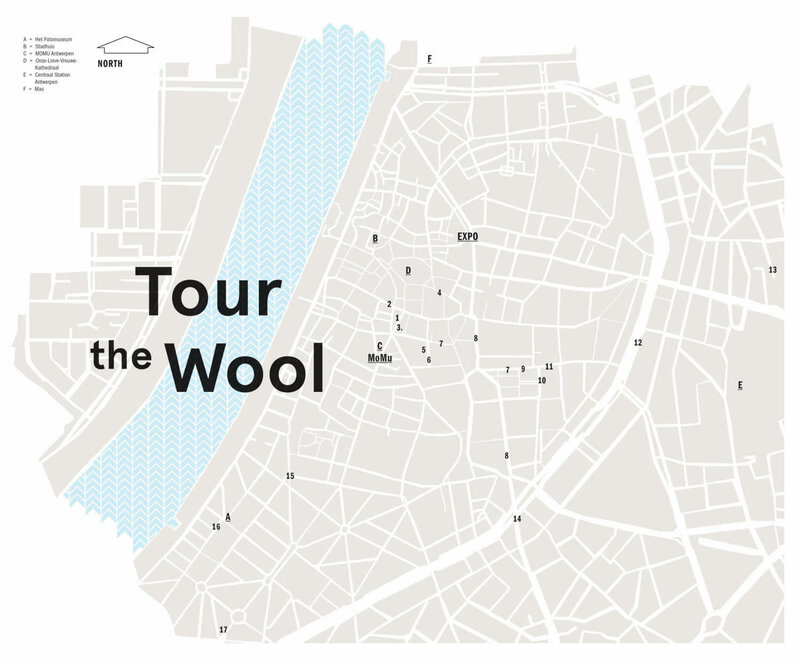 The window displays at Xandres during Wool Week will show the comfort of wool. Come and have a look! We invite you to join us for a drink and a bite to eat in our stores on Friday October 24th and Saturday October 25th. Sanne De Wolf is an artist who incorporates (ethno)-historical patterns and actions. These patterns are translated into contemporary interventions and works. An exclusive collaboration with women from Berber communities in North Africa is generated under her guidance. The carpets are made with pure new wool, hand knotted and dyed with natural pigments according to authentic techniques. During Wool Week at the Graanmarkt 13 Gallery you can visit an exhibition showing these carpets and the making process depicted by Bob Verhelst. Visit the store on October 25th where you can meet artist Sanne De Wolf. For a warm woollen Milo winter coat visit our store. We are happy to show you our autumn/winter collection which also contains Merino wool knitwear from Gran Sasso and Morgano. When you buy two balls of our lovely and soft Merino wool hand knitting yarn in the period from October 10th until November 6th, you will get one ball for free. Knitwear with Merino wool is light in weight and form-fast. Our Merino 120 yarn and the more chunky option Merino 40, are machine washable (up until 40°C). The balls have a special perk; the yarn is attached to the wrapper, so you can start knitting right away. Atelier Solarshop, based in Antwerp, Belgium, is a platform for designers and artists, founded by menswear designer Jan-Jan Van Essche and Piëtro Celestina. Located in a former shop for solar panels, hence the name, Atelier Solarshop has been providing ‘beautiful stuff’ since 2008, offering a carefully selected, and constantly updated collection of well-crafted contemporary works, harmoniously blended with timeless antique/vintage objects and furniture. Visit our store during Wool Week and find “beautiful wool stuff” from Jan-JanVan Essche and Merino wool scarfs from Daniel Andresen for a nice and cozy autumn and winter season. Knitted from our soft superwash merino wool, this jacquard jacket will be one of your favourites in your boy’s autumn wardrobe. Dual tone herringbone jacquard stitch in fox red and grey melange. Hem, cuffs and colour are in plain colour rib. Parts of the body and sleeve are in reverse jacquard knit. Long sleeved jacquard knit dress in fine merino wool. Bicolor with dominant colour lagoon and secondary colour tangerine. Herringbone stitch in floating jacquard technique. For the ultimate comfort of your baby, Bugaboo has developed three Merino wool accessories: a superfine 100% Merino wool blanket, seat liner and mattress cover. Behind every great man, there is a shaved sheep. Café Costume is what’s been missing from your wardrobe: an affordable, quality stylish men’s suit, made to measure with attention to detail and lots of love and affection for Merino wool fabrics from, amongst others, Scabal. From the wool of sheep roaming the Walonian pastures products have been made that enhance the quality of your sleep. Warm in winter and cool in summer, wool duvets and cushions benefit your well-being, your comfort and your health. With a woolen under- and cover duvet of Slaappunt you will get to experience the comfortable feeling of sleeping between crisp, new bed sheets every night. The blankets are made with non-degreased Australian Merino wool and are a perfect insulator and moisture regulator. Your bed will be wonderful, in winter and summer, without feeling clammy or muggy.